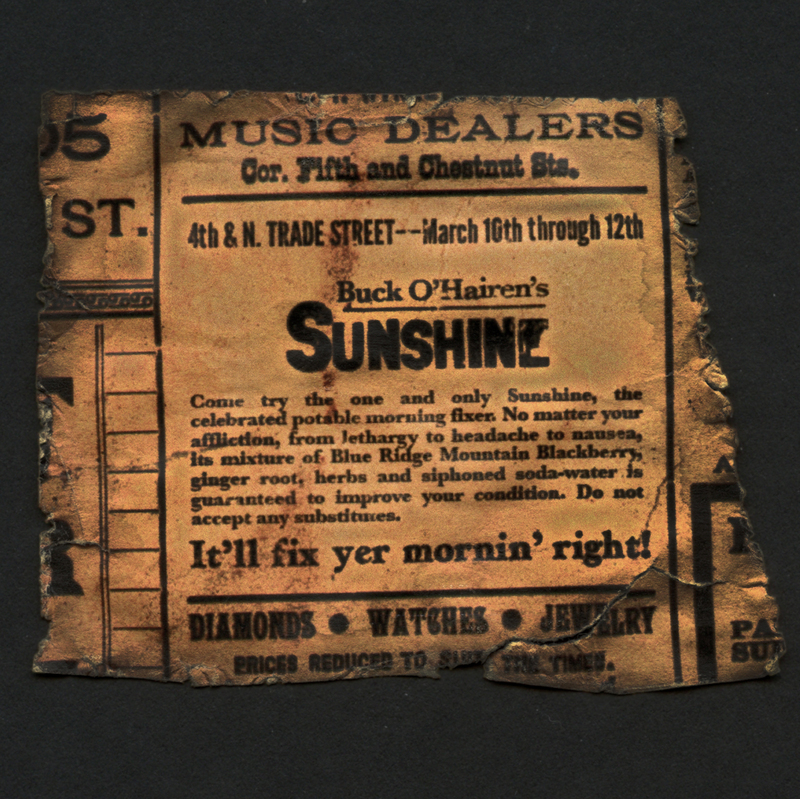 A newspaper ad for Sunshine (photo courtesy of http://whoisbuckohairen.com). I was doing some Google searches the other day about moonshiners during the Civil War, and came across WhoIsBuckOHairen.com. A leather-bound journal from a memorabilia collectors show in 2008 serves as the source for the story of Blue Ridge Mountain moonshine legend Buck O’Hairen. A few of the journal pages are posted on the site (which are a pretty neat piece of history). But what I found most interesting about this O’Hairen character is that after distilling moonshine for decades, he had a change of heart and sold a temperance drink called “Sunshine” from a traveling wagon until he disappeared in 1892. It doesn’t state that foul play was a factor or that he vanished on purpose to avoid more taxes, simply that like a cloud of smoke he was gone. O’Hairen was “…what most people would call a hobo, but he was also a moonshiner, writer, musician, entrepreneur, amateur botanist and accidental arsonist.” Unable to define easily — sounds like my kind of dude. Well, maybe not the arsonist part.